It’s the right time to write about What’s Right is Right on Right Hicks Save, right? 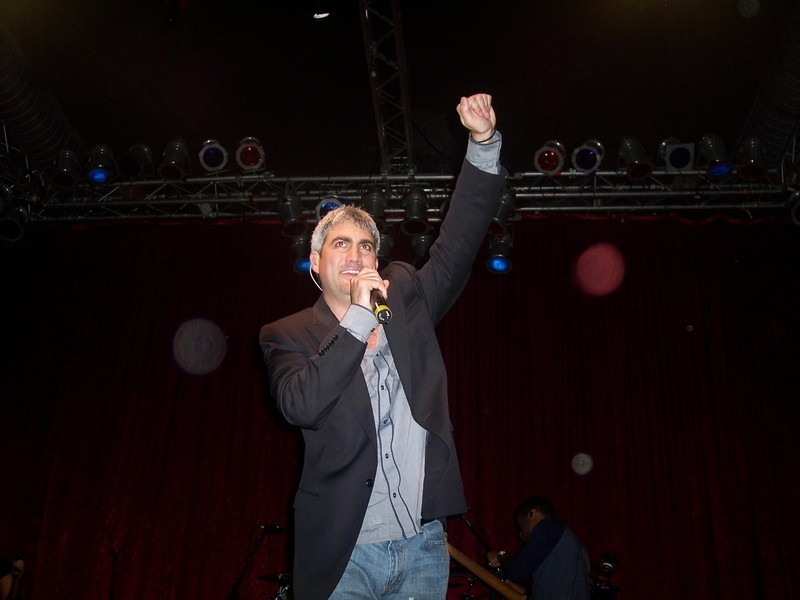 That’s right, it’s the right time to go purchase the new Taylor Hicks single, What’s Right Is Right! The Right Place is iTunes, Amazon.com or wherever fine digital downloads are sold. I think the right picture to post on Right Hicks Save to celebrate the release of What’s Right is Right is a picture of Taylor with, well, not his right hand, but his other right hand (that would be his left) hand, held up in what I like to think of as a “triumphant” pose. Taylor’s voice sounds immaculate and the melody is really pretty. It’s a simple kind of mid-tempo love song that I am really hoping will find a home in HAC/AC stations across the country. There are two stations here in the Phoenix area that are the right format, so I’ll request it. Respectfully and with great restraint, hee hee . . . This photo is just perfect for tonight. Here’s hoping that we will see Taylor raising that arm in triumph many, many times in the coming months. I know I am really pulling for him, big time. Because, no matter how many times I try to escape his evil clutches, the fact remains (cheese alert!!!) that I am with him all the way, to the finish line . . .
just purchased it from itunes! 🙂 Hoping for all best with this single and album! Great picture to go along with it! Great picture, great song, I love it ! I downloaded WRIR from iTunes earlier (for .99). I LOVE the song! That melody has been floating around in my head since last week. It’s very catchy. I’m proud to finally add it to my extensive Taylor Hicks collection. Fan For Life here! And that photo… YEAH, baby. That is one FINE pic!!! Thank YOU, Bloggerina. I like your style! O…O…O…YES! Gonna hit I-Tunes right after this. I guess if Taylor put out bubble gum and balloon trips, we’d buy it. Fantastic photo- that is certainly a victory pose if I’ve ever seen one- and he certainly deserves i t! Unfortunately, I can’t buy it,- being out of the country, I can’t download any MP3s from the US, and it’s not being sold thru Amazon Canada, so I guess I save myself $0.89, but that’s ok- I can still listen to it anytime I want. It is a beautiful song, and he sounds absolutely wonderful. Some people think he sounds like he’s straining on the high notes in the chorus- I think he’s at the top of his range, but his voice hits dead on. I am sooooo excited for him- I think this is the one to take him over the top! Way to go, Taylor!! Like Soulaz says, I liked it when I first heard it a few weeks ago, but the more I listened, I really, really grew to love it. Reasons are simple–its got this “throwback” vibe that is so appealing. I remember Taylor saying in an interview a couple months back that this album was going to have a more “organic” feel and I think I get what he meant. Regarding the lyrics, it’s a wonderful little love tune! I would think it would make a perfect wedding song. As for me, WRIR is my little love tune to my DH. His lyric is a love note! Me likey! NOW for the album! What’s Right is Right reminds me of Just the Way You Are by Billy Joel. Both songs are love songs that are lyrically simplistic but contain deep significance. JTWYA is about accepting another without condition and WRIR is about the understanding and empathy that love naturally brings. I am not an expert by any means in music, in fact, I admit I don’t know much…but I do know about people and I know about love. What’s Right is Right will touch and move any person who has ever loved or been loved. And that is alot of fine folk I guess. I wish Taylor and WRIR success, he deserves it. The best is yet to come for Taylor. I’m in the majority here… I love it. It’s a simple, soulful love song. I like the smooth R&B flow to it. The sax in it is nice. I was having a stressful day at work on Friday. After it was all over i played WRIR, and it just melted the stress away. IMO.. there’s no reason this song shouldn’t be played on AC stations. Just got my copy from ITunes. Crazy that such a little thing like a 99cent song can make someone so happy. Very appropriate pic. Love the picture & love the song! Will go to iTunes this evening & buy this beautiful song. Love the picture TaysH – There’s happiness in his eyes there, and in mine too today. I love the song !!! It’s very smooth. I like it. I love the sax. Can’t wait to hear more. The song is SO stuck in my head. It’s been playing and replaying since I first heard it. I love it. Nice pic Tays. Just bought my copy. This song really grows on you and stays with you all day long after listening to it. LOVE the song…the more I’ve played it the more I love it. Just hoping for great success for Taylor…it has been a long haul for him. He so deserves success. Loving the picture TaysH. Here’s hoping that the radio stations will pick up this tune… What’s Right is Right. I liked it at first.. I love it now! Heading over to itunes… follow me? I adore his voice. Period. From what I’ve heard so far of The Distance, his voice is front and center and I LOVE that. I like to soak up every nuance and every inflection and every growl. I can’t wait to see the video and buy my copies of the CD and I just downloaded the single from Amazon. I love WRIR! And that is a perfect picture for today. I love the ALL the comments and all the support so far. I hope this turns out to be your biggest post day EVER, TaysH and I REALLY hope there are many, many, MANY people buying WRIR today! It time for some Taylor-Mania!!! WOOOOOOOOOO!!!! (left fist in the air.) I’ll love hearing the song in my car (on my iPod) and can’t wait to hear the radio stations playing it! Is it radio friendly? …yes, indeed!!! This pic is perfect for today!!! I love WRIR…..liked it from the beginning…the more I hear it the more I love it….it gives my goosebumps, goosebumps…especially the last third of the song when his voice gets more gravely. I think it is the perfect combination of his crystal clear voice, catchy lyrics….radio friendly with a touch of Tay’s rawness..Brian G on the sax is a perfect touch also….Go Taylor!!!!!!! To tell the truth, when I first went to listen to it.. I hesitated. I was nervous for him and nervous for myself not to like it. So as the first strains of his voice started, I sat there quietly and smiled. I knew from the Ray Charles inflection in his voice and Ray’s obvious influence that the smooth soulful Taylor was back. 😉 love love love it it it….. song and photo ! I LOVED the song from the first little taste…tried to buy it on Monday…(DUH)..couldn’t wait and did download it the minute it was available on ITunes. My hubby loves it too and we both feel the love in the lyrics. The voice is captivating. I played it right before bed and awoke with it running through my head…It’s a good thing. Fist in the air for Taylor!! Hilarious title and description today, and what an amazing picture! I love the new song!! He said once that AI helped him learn to control his voice. This song certainly shows that. It is perfect for him. All RIGHT! Right song,right picture—–all is right in my world today! Yes, I like it! Song!! I’m writing a whole blog post about what you just wrote right there. Shoot! Now people won’t think I’m all smart and stuff. lol! Hoping this tune does what he wants with it. Looking forward to the CD. The minute I heard it I loved it. A great love song. Good voice. The picture is not bad either! Thanks. What’s Right Is (definitely) Right, today! Spinshack, Diplomacy at its best. I think you and I feel the same way. His vocals do sound good, I have put out my .89 in support of our guy. I want a ringtone of WRIR. Does anyone know how I can get one? Loved the song – loved the picture – love RHS for all the great pics of our Tay! This is a request for anyone who belongs to TOSP. I keep getting an “Oops the link is broken” when I try to log on. Is TOSP still in maintenance mode, or are any of you getting on? i am beginning to panic that I have permanantly lost this great site. If you are getting on, please let me know how to get it back! Does anyone else get distracted when they click on “comments” under the photo? I loved the song from the first listen and Love it more every time I play it. Some have criticized the simple lyrics BUT some of my most favorite songs are simplistic, melodic and soulful. I put it in the same class as “Georgia on My Mind”and “You Are So Beautiful”. He sings it with so much soul and feeling it makes my heart ache and soar at the same time. LOL. What’s Right is that this song is stuck in my head. I was a little nervous when I heard the snippet that I wouldn’t love it, but when I heard the complete song I really liked it and “got” it. Now, I keep hearing over and over in my head “I don’t want to go a single day without you, I don’t want to know what an empty bed feels like”. Say it again, Taylor, say it again. I hope it’s a big hit! This song has been playing in my head since I first heard the snippet….I think if he gets some decent air play, this could be “it”….I love the song and can’t wait to hear the entire CD. Caryl, you could say I was distracted also. Again. Great pic (thanks TaysH), great song – bought it when I got home. Nice pic, good song. I don’t LOVE either one, but they’re both pleasant. Love, love, love the song and the picture!! Thanks! Guys…What’s Right is Right is the one I think. It is beautiful and TOUCHING. I can feel what he is singing in such a profound way, and when a singer can paint a picture or a story with his voice…well that is a hit IF it gets the promotion. Taylor’s approach is wholesome and all-American, why who would not adore that and fall in love with him. There are so many who really don’t know who this man is, people who never watched Idol, and there are hundreds of millions, literally, will hear THAT voice and THAT soul, and THAT feeling for the first time….what a breath of fresh air in the stale music industry! I am so excited for this to hit the air waves! Ohhhhh and Grease Part 3 (the Summer/Fall Tour) is FANTASTIC for him! He will be able to tour his new album, get NATIONAL exposure, and at the same time get paid for Grease, and have them foot the bill for his hotel, meals, transportation, fuel, etc…WOW. He is so smart that man! If I didn’t know better I would say he has PhD in SAVVY! Ohhhhhhhh and the best part….he will be all around the country to see as many of us as he possibly can. He wants to bring the music to us all. That is why we love him! Beautiful, simple and pure… Ray Charles would be proud. Lovin’ the song….lovin’ the “other” right hand picture! Invested for the first time in Taylor through i-tunes today…in honor of my new Christmas i-pod…. If you heard it and you like it ~~~ Raise your hand! love it, love it, love it !!!! The voice is clear and the melody is memorable. I find myself singing it often. The lyrics are engaging. With a small exception (reach for the sky part), the lyrics deliver the message and Taylor is the messenger. It’s the kind of song he can easily sing anywhere and it will flow nicely and viewers will be able to relate to it. The song is about love and devotion, something we all search for. I love the voice, the melody and am so happy this is the first single. Taylor’s people and Taylor have been making right moves this time out and you know, What’s Right has become All-Right with me. It’s a winner for Taylor and a hint for us of what’s to come. Like the picture, too. I never get tired of seeing that gray shirt with the black piping. I LOVE the song, it makes me feel good and a great song will bring forth emotion like that. “Somehow” is one of his most powerful songs I think, for its melody and lyrics make the listener feel. So his soul connected to the song. A great song does that and Somehow has really not seen it’s day in the sun yet. Sorry to venture off to Somehow. ThisIS about WRIR, but the whole idea of Taylor moving ahead with his music, against all is odds is right. What’s Right is Right and will happen. My point is that there is a diverse market out there of people who love music and cannot understand complicated lyrical compositions and therefore cannot connect. A listener is a listener a fan is a fan, and no matter the language music is a universal speech that connects all people from all cultures and all walks of life. Taylor is the messenger and in 2009 the message is becoming clear. tlship…it is just his time. No matter what people write about him or say against him, it doesn’t matter. Work is defined in science as W=fD. This means work is equal to a force through a distance. Taylor Hicks is going to be a force this year through his new work, The Distance. What’s right is WRIR – warm and melodic, beautifully produced. I can hear the inflections in his voice over a soft drawl, and the sax is perfect. This song works for me. heard Blue Eyes Cryin’ in the Rain the other day…..very simple in words and melody…but truly a classic. brightlite, you’re post just hit me in the gut. Somehow is the song that truly shows what a brilliant songwriter Taylor is and I believe we will see more of that. I have a great feeling about the new album also. I remember when we first found Taylor’s early music and everyone was so astounded by Somehow, but so many people said they couldn’t listen to it often as it was so sad. At that time and now I still say it is a song about hope and determination. How fitting that the chef from Mexico could connect with that shared emotion through a song. I think it would mean the world to Taylor if he knew just how much his music touches people. The pic is VERY appropriate!!! Thanks!